Next in the series on Mama Shew's Gourmet Beef Jerky is this Sesame Garlic variety. 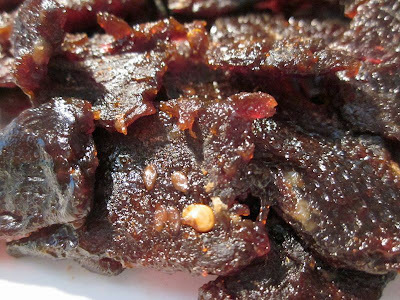 See my previous review of her Original Black Pepper beef jerky. Mama Shew's Gourmet Beef Jerky appears to be run by Sheryl Shew of Longview, WA, at least that's the name that came up when I placed an order. According to her eBay store, she got into the business of making jerky using a old family recipe for her Original Black Pepper variety. She also offers several other flavors. This Sesame Garlic variety I'm reviewing is said to be one of her newest, and her most moist. The first thing I taste from surface of these pieces is a heavy sweetness followed by a light saltiness. The thick sauce that coats these pieces have a noticeable garlic flavor as well as a more subtle sesame flavor. I can pick up a light soy sauce flavor also. The chewing flavor starts with a light natural meat flavor and a continuation of the surface flavors with maybe a more defined soy sauce towards the latter part of chewing. For being labeled as "Sesame Garlic" the garlic is moderately noticeable in the first several seconds of putting a piece into my mouth, but it seems to wear off quickly though never completely goes away. Meanwhile the sesame flavor remains only lightly noticeable, but I do in fact detect it's flavor when eating this, and like the garlic it wears off quickly. 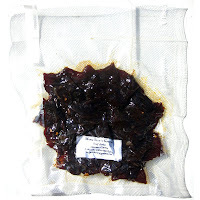 Otherwise this jerky is largely defined by this sticky sweet coating, which still has the stronger garlic and lighter sesame flavor in it, but overall this comes off tasting like a sweet jerky with a soy-sauce flavor at the end. And that soy sauce ends up having a light to moderate flavor intensity. The natural meat flavors in this don't have the same strong intensity like they have in Mama Shew's Original Black Pepper variety. In this Sesame Garlic they only play a minor role. The saltiness in this feels light initially, but becomes medium once the sweetness wears off. Overall, what you're going to notice in this is an initial burst of sweet with an easily noticeable garlic and just a lightly noticeable sesame, but both wear off quickly. You'll also notice a soy sauce flavor in the latter half of chewing, and a only a subtle natural meat flavor. These are slices of whole meat, sliced thin, and in bite sized pieces. This is a dry jerky with a moist, sticky surface. They have a lot of flexibility, bending all the way around without cracking. Chewing seems easy. The chewing texture starts out with just a little bit of initial chewing resistance, and seems to chew down to a soft mass fairly easily. At that point it has a meaty texture, much like real meat, but more soft, perhaps a little mushy. I can see some tiny streaks of fat on some of these pieces, while the others appears to be fat-free. I don't see any gristle or tendon, but found a fair amount of stringiness. I didn't encounter much unchewable wads of tissue. As for being clean eating, it's not. My fingertips pick up a good deal of sticky and oily residue that requires some finger licking and or wiping. I paid $8.99 for two packages of Mama Shew's jerky, which included 4oz of this Sesame Garlic and 4oz of the Original Black Pepper. Shipping came out to $4.80, bringing the total to $13.79. That works out to a price of $1.72 per ounce. 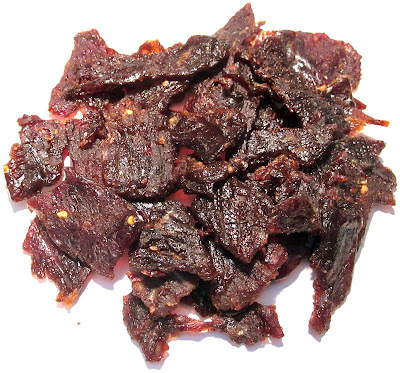 For general jerky snacking purposes, at the $1.72 per ounce price, this presents a good value. I'm getting a lot of snackability for a good overall flavor, good meat consistency and good chewing texture. That price is about what you'd pay at the grocery store for the major brands of jerky, and yet this Sesame Garlic offers a lot more snackability. As a "Sesame Garlic" beef jerky, at the same $1.72 price per ounce, it's a fair value. I'm getting a fair amount of garlic flavor initially, but an even lighter amount of sesame, both of which wear off quickly. This Sesame Garlic variety from Mama Shew's Beef Jerky starts you off with a sweet glaze that includes a noticeable garlic flavor, and a lighter but still somewhat noticeable sesame. They don't seem to last very long through the chewing, though the garlic perhaps lingers on in lighter amounts. But add to that a light to medium soy sauce flavor that comes in the latter part of chewing and it seems to give this jerky an asian character that generates a good deal of snackability. It's relatively easy to chew, and seems to have meaty chewing texture, though on the softer side. Even though this jerky offers the flavors of sesame and garlic it just doesn't belt out a homerun with those two. It's more like sweet jerky with some soy sauce, where the garlic and sesame play supporting roles. The natural meat flavors are also lacking in this, unlike with Mama Shew's Original Black Pepper where they had the spotlight. My recommended beer pairing for this, something with a light malt flavor should compliment the thicker sweet of this jerky. Go with a Fat Tire Amber Ale, or a Stone IPA. I'm very curious why this brand and a few others posted on this site will not list the ingredients? There are some of us who are allergic to MSG and certain other additives. I don't find that to be fully honest and safe! And to Janie from hoj, I hope you don't take this the wrong way. Review Uncle Mike's beef jerky next please.